Indian woman in saree would be my style choice for cultural night after finding out how easy it is to put on the saree or sari. Basically you use a long length fabric, wrap around your body, make some pleats in front and cross the edge of the fabric over your shoulder and let it hang on freely at your back. 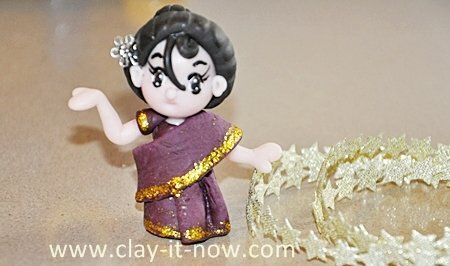 Air dry clay in purple, black, and skin color. You can make your own clay with my modeling clay recipes or buy the air dry polymer clay that will dry hard. Black marker and white acrylic paint. First of all, make the body of the figurine with skin color clay. It is a slim cone shape with height about 1 inch. Roll the purple clay to pipe shape, flatten it with rolling pin and wrap around the top body about 1/4 of the whole body. You can add gold glitter after it's dry. Roll two pipe shape in skin color to create the arm, make one edge rounded, flatten it and slit with your clay knife to form the palm, thumb and the rest of the fingers. Take the balance of your purple clay and wrap it on top of the arm to create the short sleeve. Position the arm, use kitchen towel to support the arm until it's dry. It's time to roll a long, thin and flat purple clay now. Wrap it around the body of the figurine, hold the edge, make the pleats in front of the body and throw the edge to the back of the body cross over the left shoulder. Make sure the length of your clay is about 4 diameter of the body. Leave it to dry completely. The head shall be done in the same way with other mini figurines, start with a ball shape about 3/4 inch or bigger if you like your figurine bigger. Press the eyes area with your finger, make the mouth, add the nose and ears and leave it to dry. Draw the eyes and the eyebrows. You'll have the basic figurine face but if you like, you can change the expression as you like by drawing different shape of eyes or eyebrows. Next, attach the head to the body. It's done!